Sometimes we'll come up with words, or shorthands to ease the quaking burden of conversation with other human beings (ie language evolves). This is where you can find definitions of them, without having to darken my tower with your noise. Many of these have derived from None of That: A Black Books Podcast. This is a living page, so if you hear us use a phrase that you don't understand, tell us and we'll define it on here for future listeners. Lie-Hole When a character in a sitcom tells a lie to avoid having to deal with consequences, but then have to tell further lies to avoid letting on they lied in the first place. 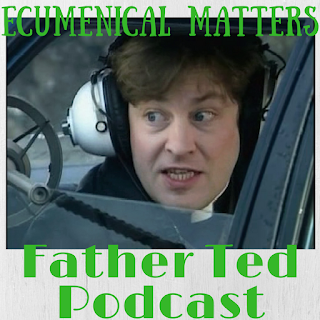 Meet Your Maker: A feature in the podcast where cameos by Father Ted creators Graham Linehan and Arthur Mathews are spotted. The Congregation/The Customers: A collective term for the listeners of Ecumenical Matters and None of That respectively. Graham: Refers directly to Graham Linehan, co-creator of Father Ted and Black Books.